Africa, to be more specific we are talking about Namibia. Great land forms and exotic animals Namibia is truly one of my favourite places in the world. For a lot of people not even knowing this fantasy world exists, I do get the question “how to you prepare to visit the dry lands of Namibia?” Not to worry I will be your helping hand and braking it down for you. Rule number one sunscreen,always remember your sunscreen. Namibia might be beautiful but the harsh sun will teach you a lesson you will never forget if you forget your sunscreen. Second thing you want to bring along is a LifeStraw. This is also an important tip that you avoid tap water in Africa to stay healthy. A LifeStraw is cheap and takes up little space in your bag. Also if you travel a lot in Africa I recommend a passport holder. You will always have your passport on hand and a passport holder also protects your passport. I also use my passport holder to store other valuables. First-Aid kit, if you travel not just to Namibia but to Africa the rikfor injury is no higher than anywhere else in the world, but the chance of infection is very high. So to be on the safe side, take a first-aid kit with you. Let’s talk shoes. The right type of shoes is so crucial. You need something comfortable, like hiking shoes. Hiking shoes are very, very comfortable and also allows your feet to breath. You should keep in mind that Namibia is a dry country so water must be on top of your list. Although you will find a lot of bottled water being sold, take a stainless steel water bottle with you. To always have water with you is a good idea. You can use it with your LifeStraw. The list of things you will need to travel to Namibia is long. But if you have your basics you will be just fine. Now we can look at your travel plan. There are very exciting places to see in Namibia and different ways to see it. If you take a trip with a tourism company, you can travel with Ultimate Safaris or Explore Namibia. They are the best tourism companies, from my personal point of view, in Namibia. But truly the best way to travel through Namibia is to get a car and to take a road trip through the dazzling country side. Plus the freedom you have to stop and go as you please makes self-driving in Namibia very rewarding. Here are some tips of things you should have in your car. The four main things will be your camera, to take pictures of your adventure. Water, water is always a go if your travel in Namibia. Snacks, when driving make sure you have something to eat to keep your sugar levels perfect. Sunglasses and sunscreen, both are very important. When taking a road trip you should also remember to fl up on petrol when you can. If this is your first time visiting Namibia here’s a friendly reminder, take a GPS with you or at least know the major national roads and only take secondary roads if your car can handle it. Plan your trip ahead of time, meaning before you set out on your adventure make sure you know where you are going and what roads you are going to take. Believe me when I say you do not want to get lost in Namibia.One way to also maximise your time in Namibia is to take a plane for some of the long distances. If you combine the two driving and flying, you can see and take in as much as possible. But to do both will be pricy so only consider this option if your pockets are really deep. 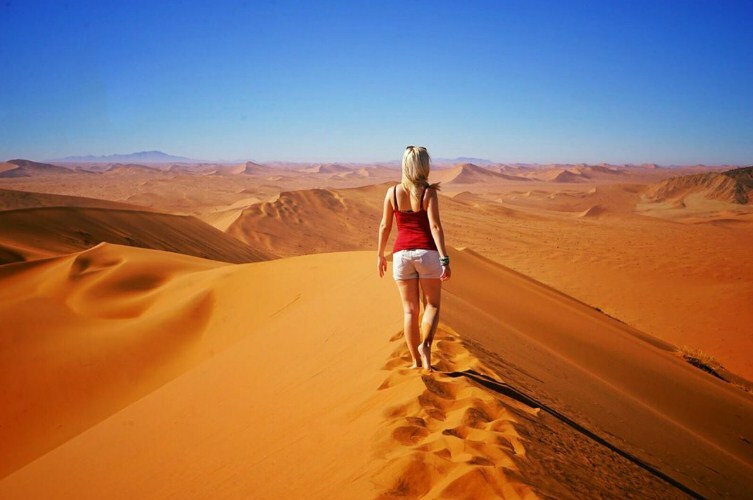 Let’s look at when to travel to Namibia. As I said before Namibia is dry and you need to pick the right time that suits you to go. April to May is warm and clean, June to August can be cold at night, and September to October is good for game viewing, because the animals mostly gathered at water holes. Must see places in Namibia. I have talked about how beautiful Namibia is, know we are going to look at places that are so breath taking, in Namibia it would be a sin not to visit them. First on my list and should be on yours too is, Etosha National Park. This wildlife reserve with diverse landscapes is “One of the most amazing, beautiful places I’ve ever seen” said one of my close friends when she took a trip down to the wild park. Be prepared to see some lions, rhinos, cheetahs, African Elephants the list goes on. If you really want to see the wild animals of Africa there is no better place than Etosha National Park. Second place that’s a must see is the Fish River Canyon, the second largest Canyon in the world. You can achieve a list of activities including hiking, camping and relaxing in the Natural hot springs. If you are planning on going to the coast I recommend you going to Swakop-mund and visiting the National Marine Aquarium of Namibia. You will see a magnificent underwater world filled with differnt sea animals. All the animals displayed in the Aquarium are found in the very ocean waters right outside the Aquarium. Namibia also has two of the most breath taking water falls you have ever seen. That is if it’s rainy season. You get the Ruacana Falls and the Epupa Falls. My personal favourite is the Epupa Falls the water fall is so amazing it’s something out of this world. You can also find a camp site by the water fall. After a long day a nice place to sit and relax with a cold drink in your hand and a beautiful view that is what Namibia can offer you.